There are certain places you hear about in the world that you almost feel like you know even if you have never been there. Names like “Paris” and “Rome” bring up images of the Eiffel Tower and Coliseum respectively, right? Of course, when you picture, “Pamplona” you picture the running of the bulls, correct? 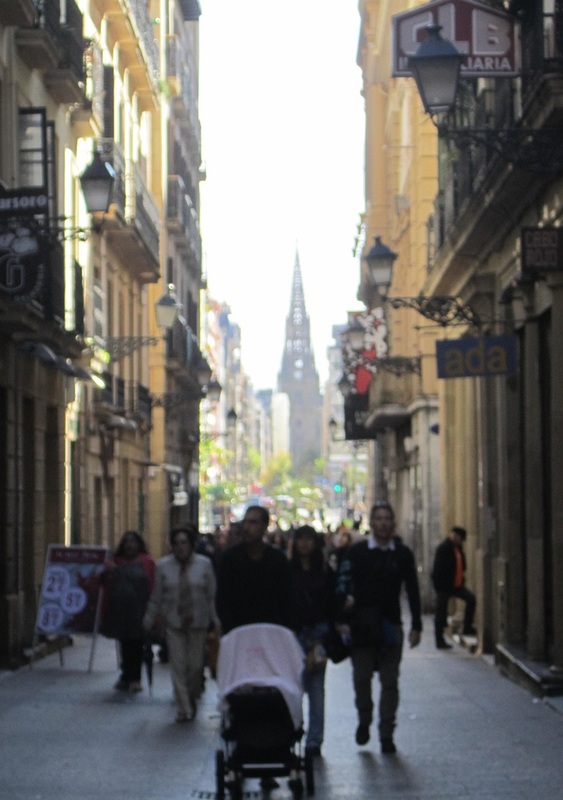 I thought the same thing up until a couple of weeks ago when the family and I had the good fortune to make a slight alteration to our northern Spain journey and dip into Pamplona for the day. 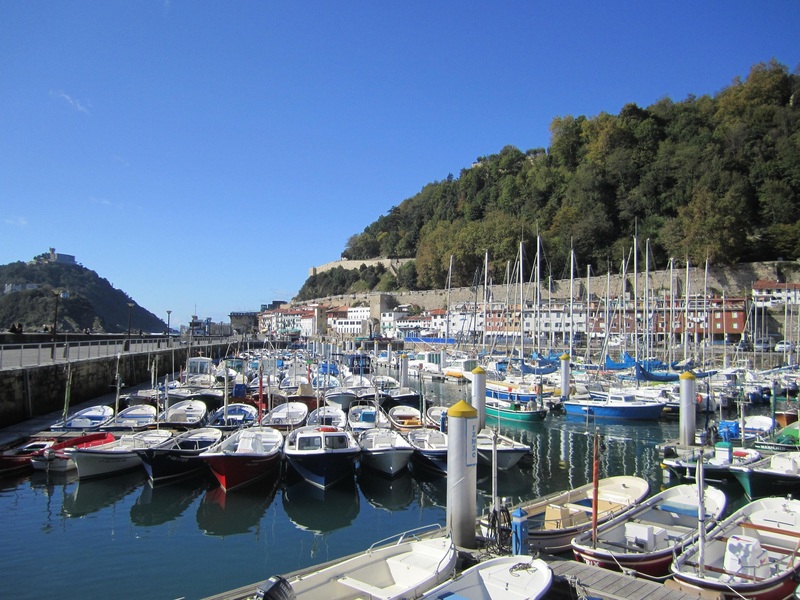 It was a last-minute decision on the way to San Sebastian and ended up as one of my favorite surprises of the trip. As it turns out, there were no bulls in the street (despite Little NH’s imagination) but the streets were filled with great restaurants and the plaza mayor was sun-soaked on this fall afternoon. The old town of the city is warm and hospitable. 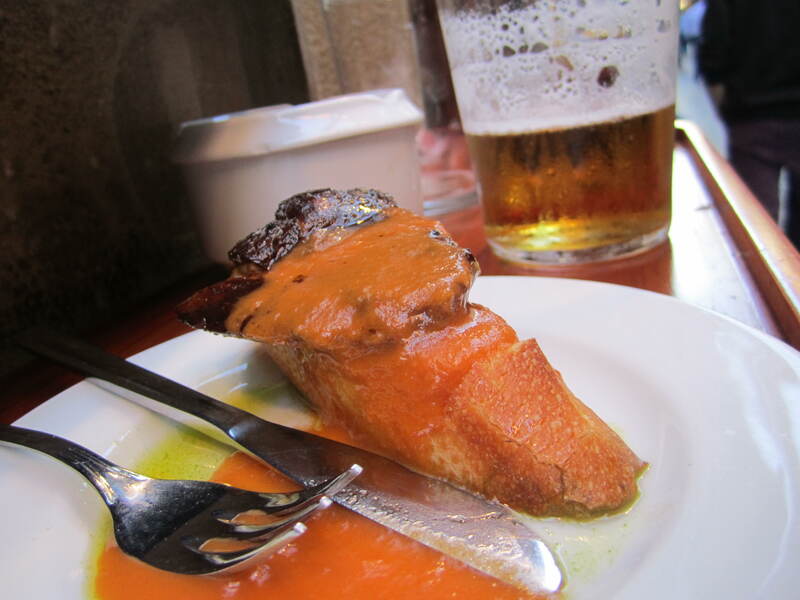 The food, as in all of Spain, is top-notch – even in the touristy areas. 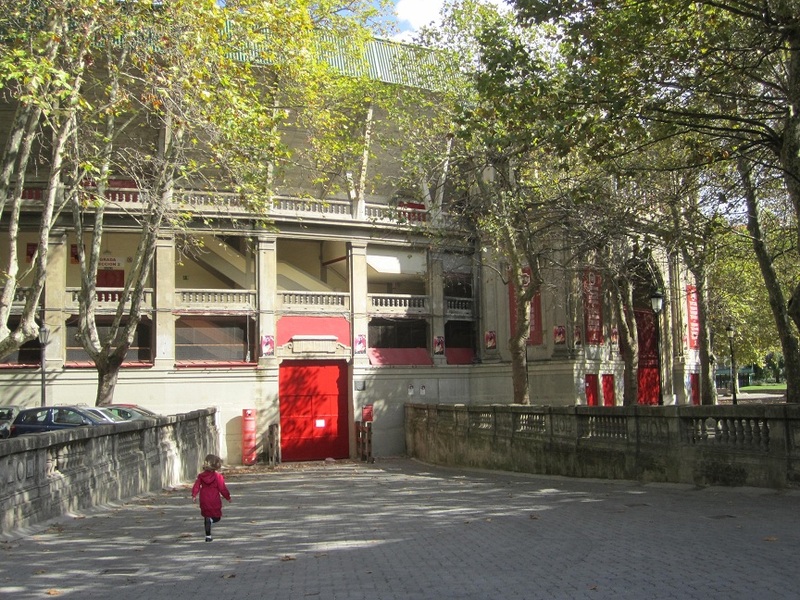 Pamplona’s biggest claim to fame isn’t hidden away, however. Along the streets that make up the 826 meter “encierro” to the Plaza de Toros, are signs that demarcate the path that the bovines take, hot on the trail of targets for their sharp horns. I don’t know about you but I prefer to find my surprise in the charm of the city rather than the surprise that awaits some poor runner on a sunny day in July – particularly if it comes at the ends of the horns of a bull. Spanish cooking is very traditional fare. 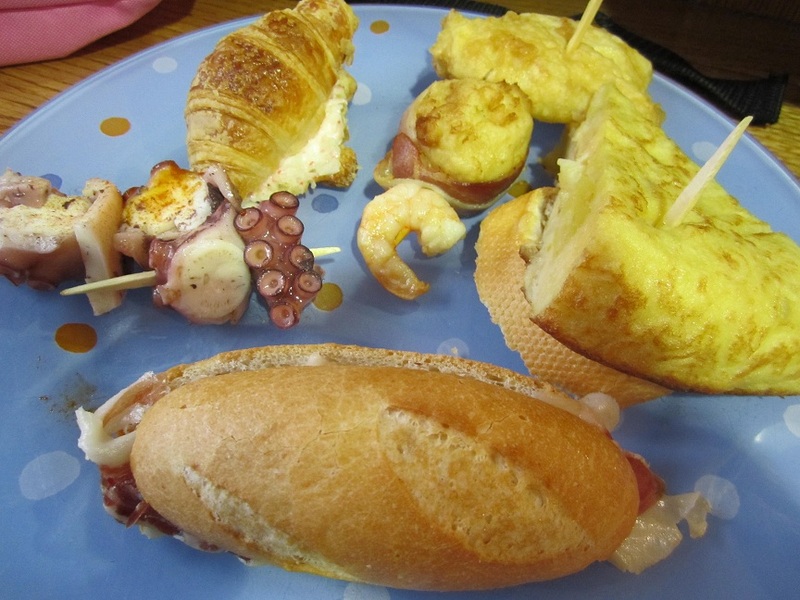 Unlike other European cultures, there is not a prevalence of foreign foods on offer in the bustling cities of Spain. There are exceptions, of course. If one looks hard enough, you can find a smattering of Japanese, pizza and even burger places. 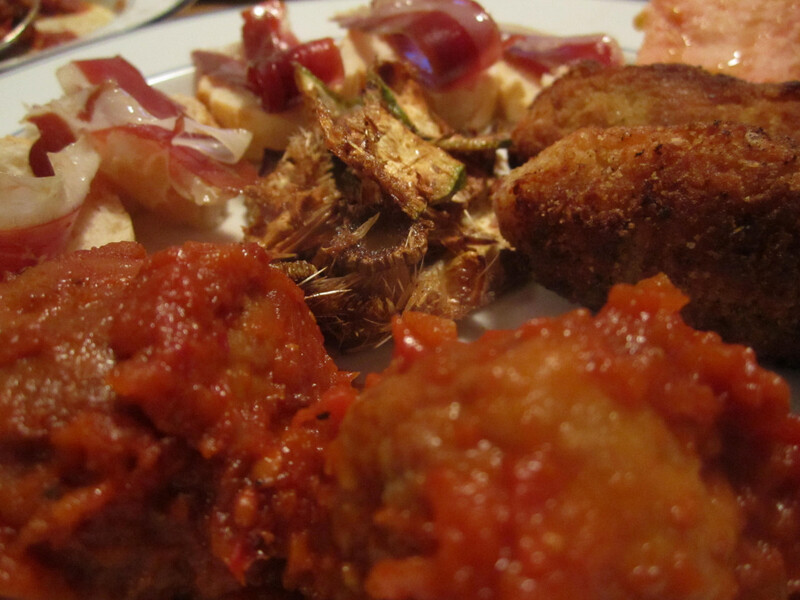 However, the preponderance of cuisine in Spain is very fresh and very Spanish. That’s why when Mrs. NH and I stumbled across these patatas alioli, we took notice. 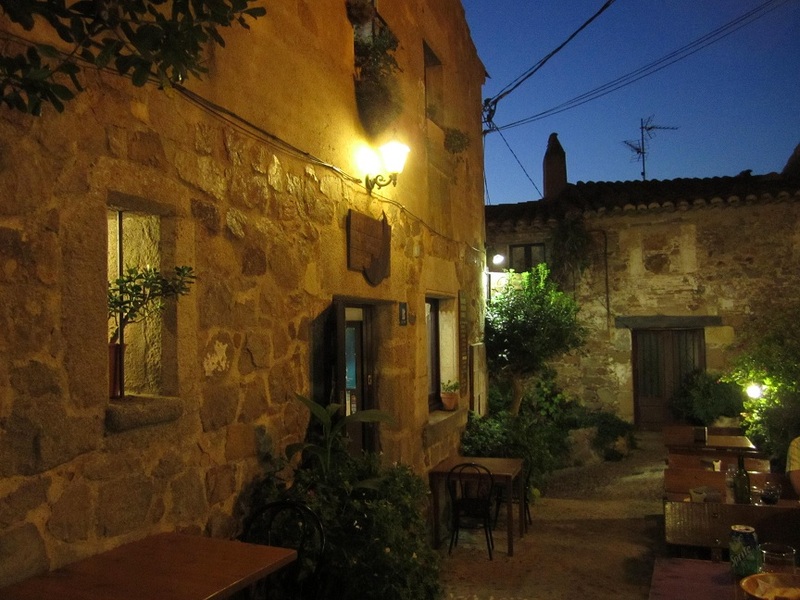 It was in a restaurant tucked in a side street at the top of the old town of Tossa de Mar in northeastern Spain called La Lluna. The patatas arrived piping hot with an inviting garlicky aroma. The shape was the first thing we noticed. They were round, restaurant namesake appropriate half-moons of perfectly crispy on the outside, creamy on the inside potatoes. They were still covered in bubbly tender skin. The edges of the moons were flaky and crispy and the whole piece was sprinkled with just enough sea salt to really make it zing on the palate. 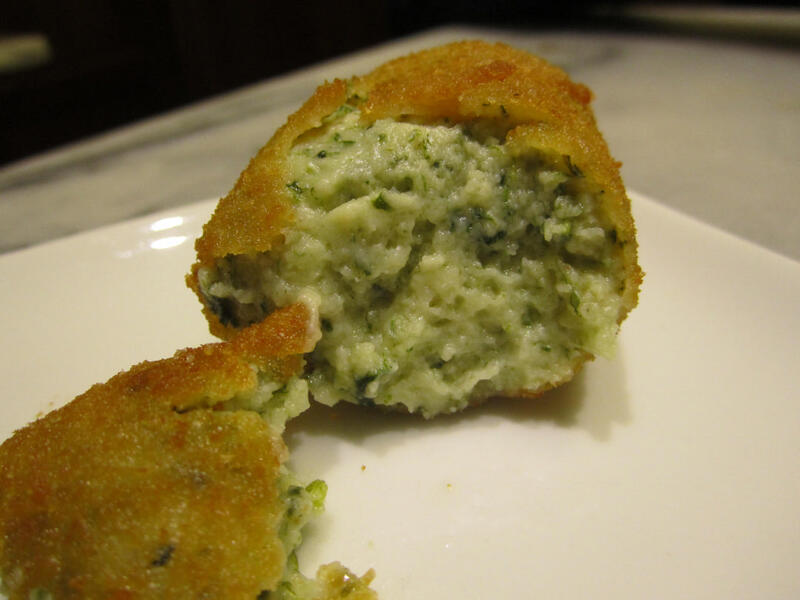 The alioli was thick but began to melt slightly as it rested on the warm potatoes adding a luxurious creamy texture to the already fluffy, smooth centers of potato. Mrs. NH and I have always been huge fans of patatas alioli but this batch stands out as one of the most delicious versions we have encountered. The dish pushed the boundaries of the traditional dish in both shape and pure rustic goodness without leaving behind any of the authenticity. The dinner at this restaurant was so good that we decided even before we finished our first meal that we would be back again the next night. As if to punctuate our decision to the friendly and helpful staff, we left proclaiming “hasta mañana!” Needless to say, we kept our promise. Ever since I turned 18 and left small town Nebraska for Spain, I’ve become a bit of a nomad. I’ll always be a red-blooded American but when people ask, “Where are you from?” it gets harder to answer with each passing year. So, to compensate for this lack of real “home” I’ve collected a short list of places I return to when visiting a particular city. In DC, it’s the Old Ebbit Grill. In Rovijn it’s the Puntalina. However, of all the places in the world, one place towers above all the rest and feels as much like home as sitting on my couch. That place is La Bodegueta in Barcelona, Spain. Resting on a nondescript corner in the Eixample area of the city, la Bodegueta is, to me, one of the best places on earth. I’ve been there probably 20 times and am only blogging about it now because I want to do it justice. But this deed has shaped up to be as difficult as, say, writing a post entitled, “Why I Love My Mom.” Where do you start? 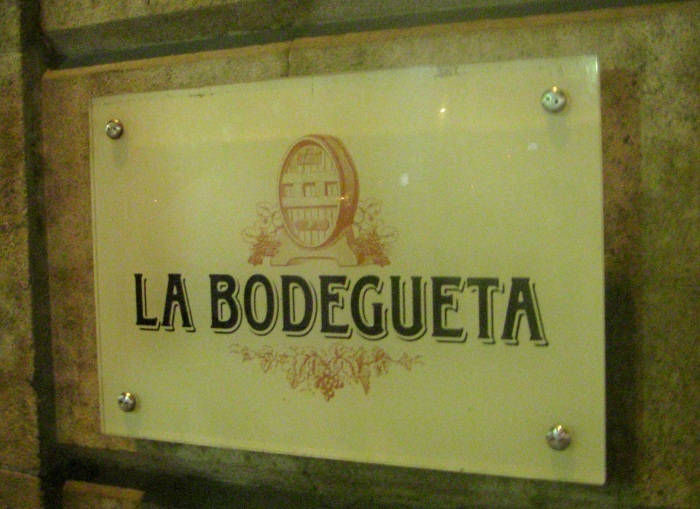 I’ll start with a short description: La Bodegueta is an old wine bodega down a few steps on the aforementioned corner. But it’s much more than that. It’s the place where I was reminded that it’s not “el menu,” it’s “la carta.” It’s where the big earthenware jug on the bar holds olives that seem to magically appear. There are the shelves of wine on the wall that seem one bottle short of completely collapsing under their own weight. There’s the gritty, smoky, dusty whole of it. Yes, it’s one of the greatest places on earth. As soon as you walk in, you’ll see the tile floor and short tables that seem to be from a time when Europeans were really short. My wife discovered Pimientos de Padrón here. We tried them on our first visit and we’ve had them every other time they’ve ever been on a menu (or carta) anywhere. There are the heady cañas, endless glasses of dry red wine and the zip of sherry to round out the meal. This is where I get to hear a wine described as “la hostia!” Yeah, stuff like that makes me pretty happy. Finally, there’s the matron saint of La Bodegueta. I won’t tell you her name because it’s not my place, but if you go, you’ll recognize her. I bummed a Marlboro Red from her a few years back when looking for the perfect end to a long, caña soaked tapas extravaganza. We struck up a conversation. Since then, I have made it a point to pay her a visit every time I’m in Barcelona. She embodies everything that La Bodegueta is. She now knows everyone one in my immediate family by their first name. I consider her a friend. That’s hard not to like, too. I’ve had the incredible good fortune to visit this place with my child, wife, parents and brother. One time I even got to visit with all but one of them at once. It’s a place where I go and inevitably end up taking stock of my life. What has changed since my last visit? What will I be like the next time I come? Who will be with me? It’s little pit stops like these in the middle of life that make you savor the passing days; places like the Bodegueta make that possible. They say you can never go back home. Maybe, but as long as La Bodegueta exists, I’ll be pretty sure that I can get awfully darn close. I’m pretty sure that having been there, my mom would agree. Sometimes, all it takes is one plate of something to justify a blog post. On my latest trip to Ciutat Comtal in Barcelona, Alcachofas Laminadas were that plate. 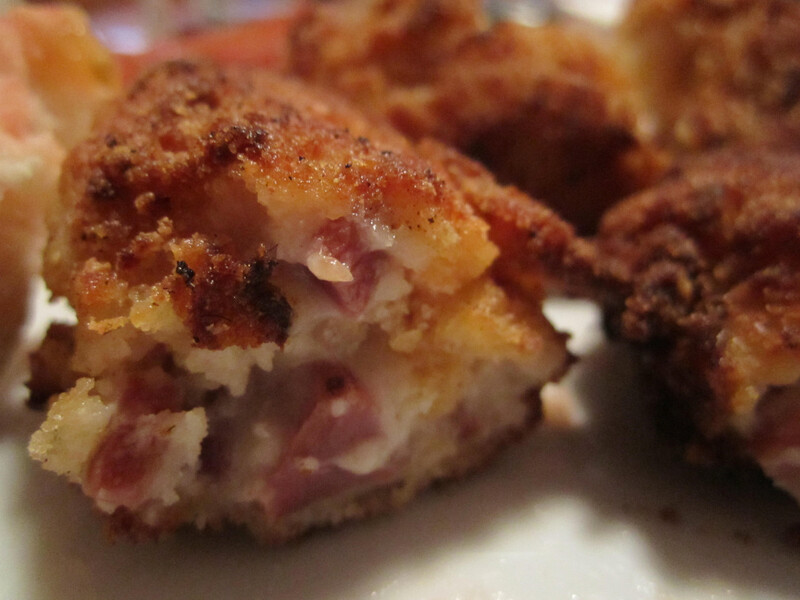 It is a dish that only the Spaniards could pull off. 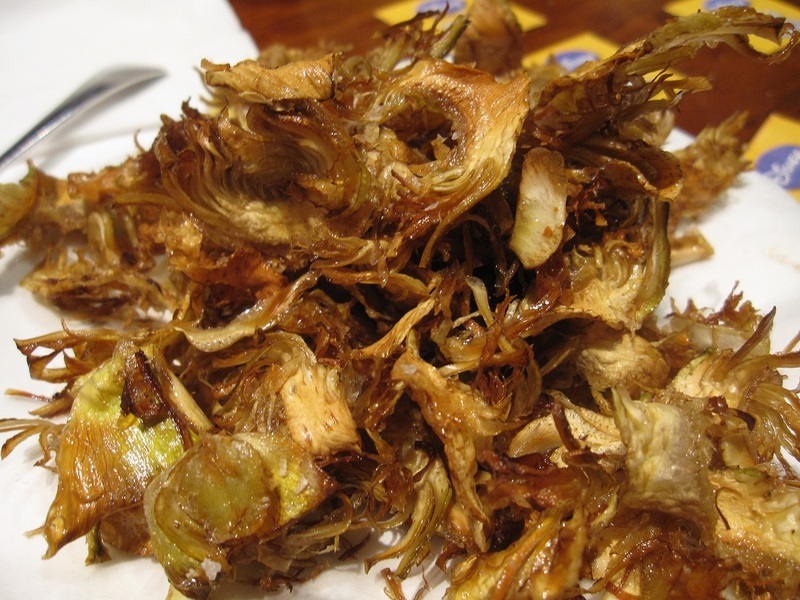 It’s completely simple (artichokes, salt and oil), but so full of flavor and head-scratchingly brilliant in execution that it has to be applauded. 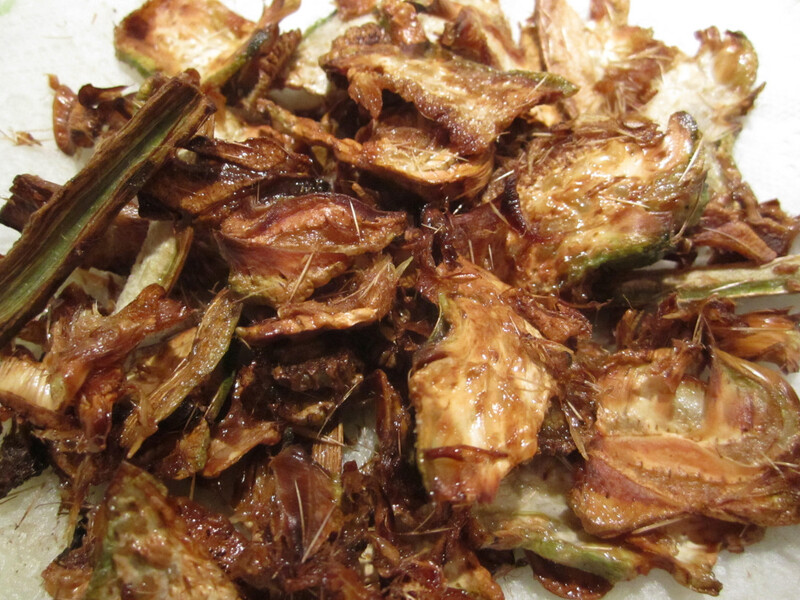 The warm plate, which sort of resembles tiny crabs or sci-fi aliens, contains a crispy, salty, rich snack that is not to be missed. As a matter of fact, it’s a wonder that somebody hasn’t come up with the idea to bag these up and sell them at the gas station. Every time I go to Barcelona, I print out a paper list of my favorite places in the city. The majority of the time that I’m there, I am showing a few other people around, so it helps to be a little type “A” and have the printed list in my back pocket – complete with days/hours of operation as well as phone numbers. 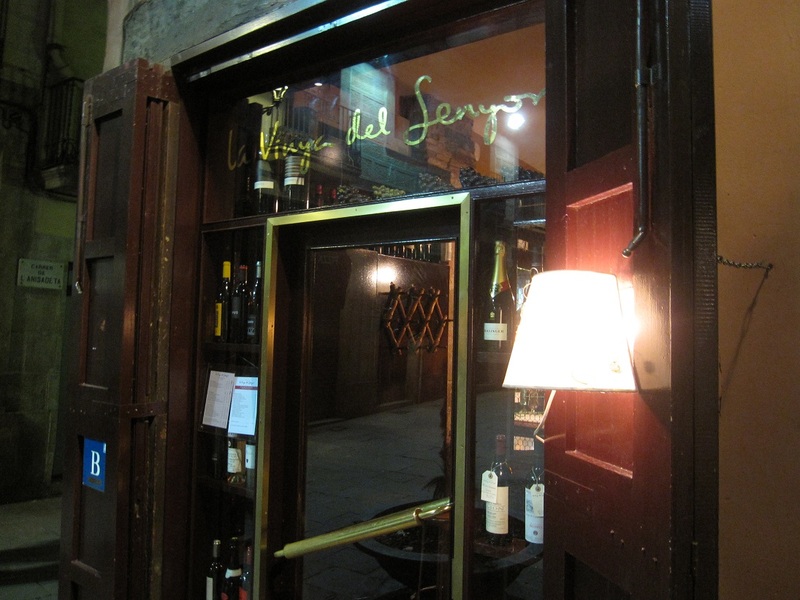 One of the bars that has been on the list since its inception is La Vinya del Senyor in “El Born” or the “Barri Gòtic” of Barcelona. La V del S is one of the reasons that Barcelona is as great as it is. 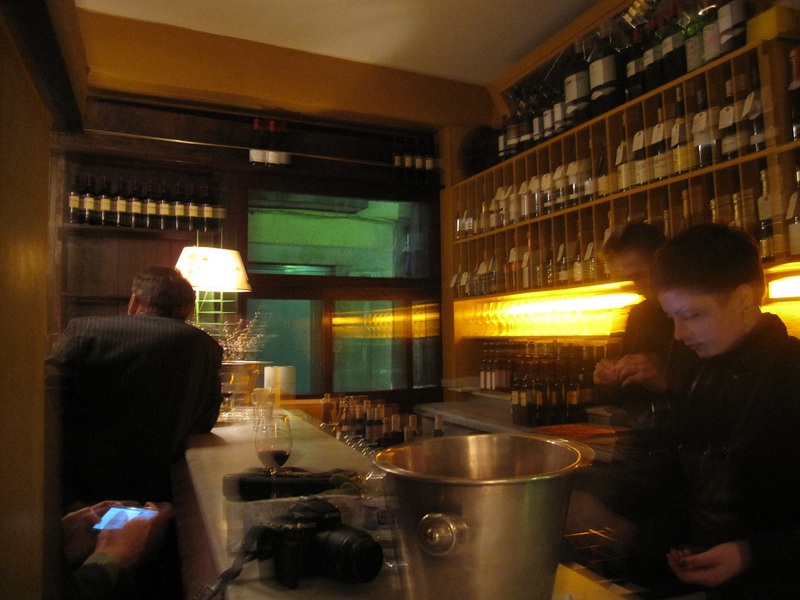 The wine bar is located across from the Santa Maria del Mar Cathedral and sits on the very quaint Plaça Santa Maria. Tables are outside and offer great people watching and wine sipping al fresco. However, due to the time of the year of my travels, I’ve spent most of my time there bellied up to the bar inside. The people watching there is the best and the cozy atmosphere makes a nice contrast to the cool marble bar that produces some delicious wines and rustic, no frills meat and cheese tapas. The wine card itself is nearly twice the size of the Magna Carta and way more interesting. Wines from around the world are available. However, if you’re like me, you’ll probably be fine with the 10-15 wines in the “featured” selection that is appended to the full menu. Wines from around the world are offered as well as several gems from Spain. Spanish wine is underrated and really unknown to most connoisseurs. Luckily, La Vinya del Senyor does a great job of highlighting some good wines that pair especially well with the tapas on order. Granted, it’s not your typical tapas bar fare. They offer good mixes of cured meats, cheeses and “Topnotch Scroggin.” Gotta love that. Funny names aside, this is a wine bar not to be missed in Barcelona. The staff behind the bar is friendly and, like many places in Spain, forgiving and appreciative of those who at least make an honest effort to order in Spanish. What I should say is, the stare from behind the bar is not quite as icy as the one served up at el Tempranillo. In fact, on my last visit I managed to get a couple of smiles. Of course, that could have just been them reciprocating the expression that was plastered all over my face. La Vinya del Senyor does that to me. There are lots of places in this world that I love to go but the only one that makes me more excited to travel to than Texas is Spain. I spent a year in Spain as a foreign exchange student way back when and the luster if the Iberian peninsula has never faded for me. I speak the language so it’s a bit like going home. To make things even more interesting, Little NH and I sat in front of the TV this evening streaming Flamenco dancing videos from YouTube on the big screen. She danced, twirled, and clapped along. 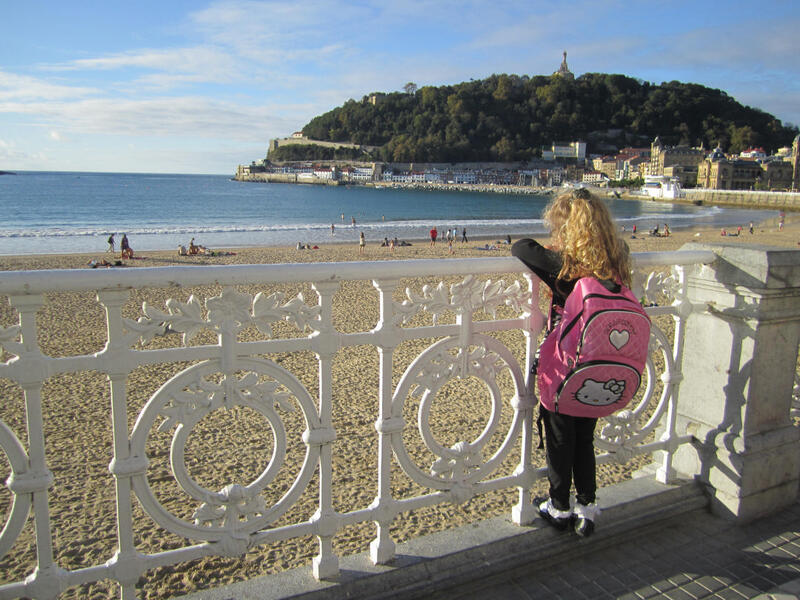 After each one, without fail, she said, “I want to go to Spain, Daddy!” When I explained that our plane doesn’t leave for another day she burst into tears. Now that I think about it, I don’t blame her a bit. The good news is, we’ll be in Barcelona eating, drinking, dancing and ogling mobile phones (well, only I’ll be doing the last one) very soon. Expect a smattering of reports from the road and a whole lotta restaurant reviews when we return. Hasta entonces. I was out to dinner the other night with my family and friends and did a little research before I went. It was a warm summer evening and we were going to be dining outside under a cloudless sky. The thought of sucking down heady Czech beer seemed a little heavy handed to my palate so I made a strategic decision early on. I ordered one of my favorite drinks, Sherry. I’ve written about a few of my experiences with this typical Spanish drink before but nowhere outside of Jerez typifies it more in my mind more than the place I’m about to tell you about, quietly, like a well-kept secret. The place is – come closer – La Venencia in Madrid, Spain. My first experience in La Venencia was brought on by my wife, well, needing a bathroom break. We were cavorting around Madrid one evening about nine-or-so years ago and nature called. The rest, as they say, is history. My wife found what she needed and for me the doors to a secret world opened by dumb luck. Upon my first visit, I had no idea where I was. I didn’t know what they served but I did see a whole lot of what looked like wine casks. I figured I could at least get a glass of wine while I waited. So, I asked for a glass of “algún vino blanco y seco” (some dry white wine). The guy behind the bar just smiled and said “Solo tenemos blanco.” Not knowing what I had stepped into, I did what came naturally. “Vále” (OK), I retorted. The next 7 seconds passed, he smiled and, for some unknown reason, decided to take pity on me. He reached for one of the five corked bottles behind the bar and poured the light, grassy copita of Sherry. “Fino,” he said as he re-corked the bottle and scrawled my order on the bar in chalk. My senses were reeling. Chalk on the bar? Leather on the walls? Casks? Air impossibly thick with smoke? This must be it. Heaven! 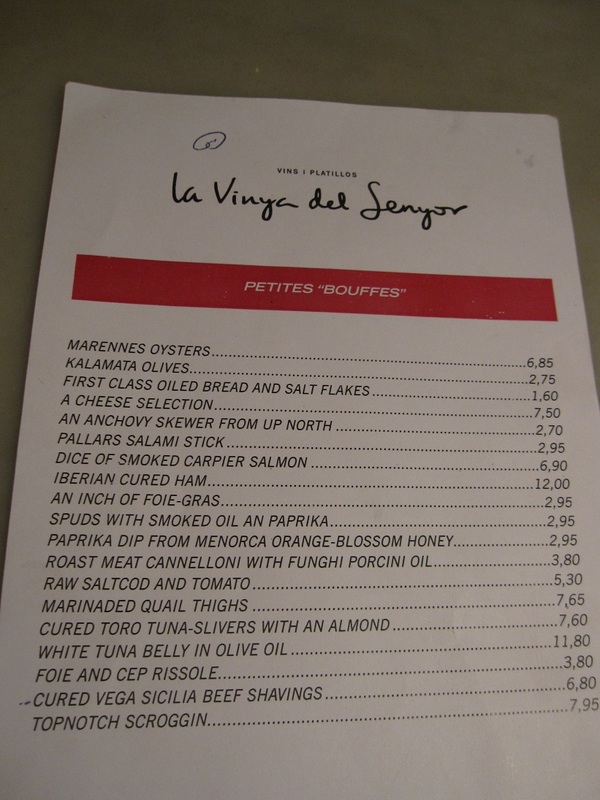 For anyone with even a passing interest in Sherry, it was and is a slice heaven. 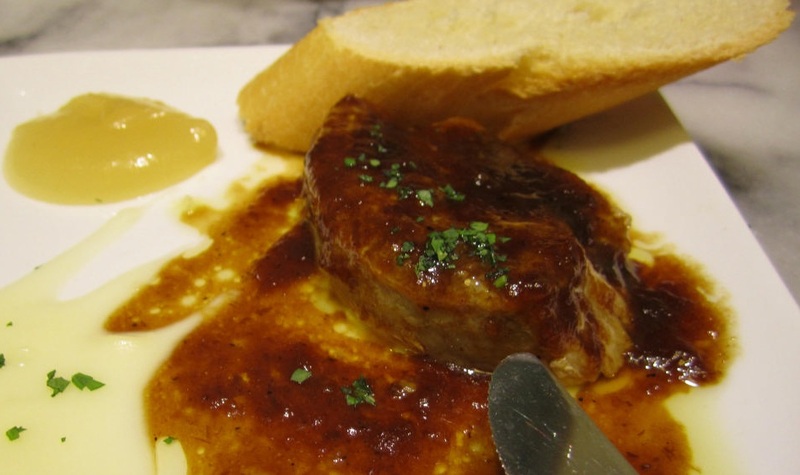 La Venencia is about as authentic as anything gets in all of Iberia. From the people behind the bar to the impossibly yellowed posters and pictures adorning the walls, the place is so Spanish it hurts. It’s the place where my wife turned into a Sherry fan and I believe the place where we first considered the idea of a trip to Jeréz which we just completed earlier this year. It’s also a place that I visited with my brother while in Madrid – on several occasions during our trip there. In fact, every time we walked by and it was open, we stopped in for a copa. From the Seco Amontillado, to the Fino, to the Manzanilla (among others), all glasses are served with an intensity and sacredness that really respects the liquid that is being poured as much as the tradition of the place. Rounding out the flavor package are the complimentary plates of tapas that go with the delicious copas. The olives are some of the best I have had in Spain. 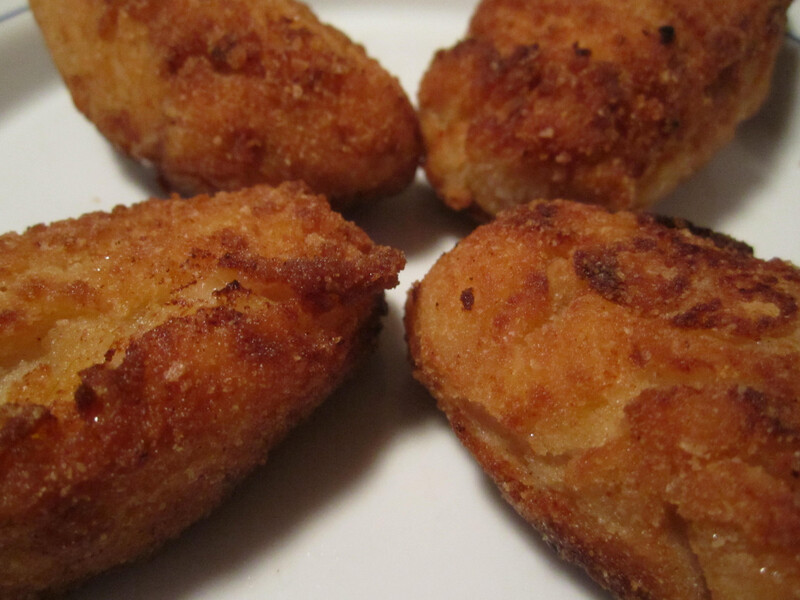 Garlicky, slightly salty, and steeped in grassy Spanish oil. The cheese under the glass cover behind the bar is a queso de cabra, I believe, but can’t be entirely sure. Then there are the slices of chorizo that seem to melt in your mouth and lay the perfect foundation for a sip of this Spanish ambrosia. Finally, there are the people themselves. The faces behind the bar are solemn and seem as worn as the dark brown wood and the leather covered walls. Their faces appear to tell a story of the place with years of tobacco smoke plotting a sort of relief map of Sherry history. They can be fairly conversational if the stars are aligned correctly. On one early visit, I was mistaken as an Italian and the bartender seemed amazed that I was, in fact, an American. This bar would be an impossibility in another country. Not only could one never find this many smokers in one city but the phenomenon of Sherry is purely Spanish. However, there is something else. This is Spain, or more specifically, Madrid. It’s the tradition of the city. The grittiness mixed with hospitality that exists but is not over-exuberant. It is authenticity like I have never witnessed anywhere else. Of course, it wouldn’t be the same without the Sherry. And, oh, the Sherry. Perched on a corner just around the bend from Cava Baja and just up the street from Almendro 13 sits one of the most quintessential Spanish hipster wine bars that I’ve ever seen. When I say hipster, I must make it clear that I’m not talking about Euro-hipsters – the vapid, label-wearing big sunglass bunch. By hipster, I mean that its home to young, hip, Madrileños. The group that congregates at Corazón Loco is a likable crowd. There’s your fair share of piercings and tattoos in the bunch but they’re a congenial lot overall and they won’t stare too hard at a couple gringos and their curly blonde-haired, blue-eyed daughter on a Sunday afternoon after El Rastro. The requisite chalkboards behind the bar advertise the wines that they have on hand and, as with El Tempranillo, it’s best to go to the bar with a good idea of what you want to order and a good accent. You can’t go wrong with what they’re pouring so there’s not much to fear. But man cannot live by wine alone so Corazón Loco also has a good menu of eats on the chalkboard to the left of the bar. 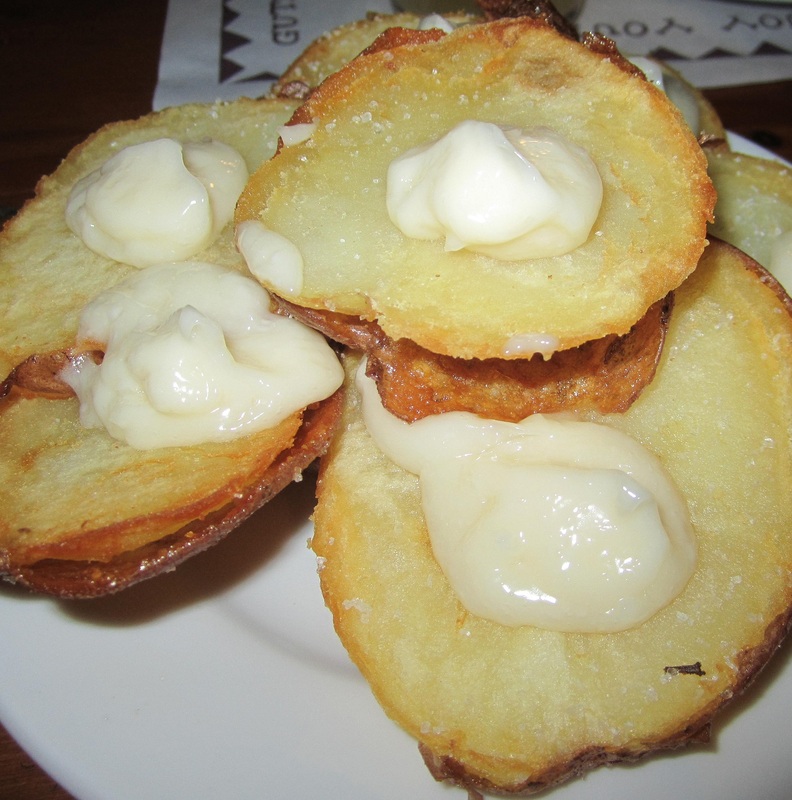 The “Papas Arrugadas” are one of my favorites and are perfect for splitting with some friends while relaxing on the beer keg barstools. The potatoes themselves are a Canary Islands specialty that come with a green and red sauce that has to be tried to be believed. Never has a boiled, salted little potato tasted so good. They’re served with a red “mojo” pepper sauce and a green one that, I believe, is a garlic and cilantro mix. Everyone ends up liking one over the other but both sauces are super tasty. In the back of the establishment, there is more of a sit-down restaurant. It looks cool but I’ll admit, I’ve never been back there. The front wine bar area is where the action is and the corner location gives one a strategic view of La Latina and all of the goings on in the Costanilla San Andrés. It’s an inviting atmosphere and one that I return to every time I’m in Madrid. This place is the real Spain as I remember it. The Spain before the EU, mass immigration and the Euro. It’s the Spain that I hope never goes away. Spain is a big country and the amount of culinary diversity is immense. Tortilla de camarones is a standout, however. If you ever find yourself in a restaurant where it is served, order it – and don’t forget the manzanilla. Our last trip to Spain opened my eyes to lots of new food and deepened my understanding of a few of the most classic Spanish drinks. One of the tipples that I really got to know on this journey was Sherry, or Jerez, as it is called on the peninsula. I’ve been a fan of Sherry since the first vacation to Spain with my wife. Oddly, when I lived there as an 18-year-old foreign exchange student, I didn’t get into it. I think I was too busy discovering J&B with coke. (Don’t ask.) Anyway, a little more maturity has paved the way for the immensely satisfying world of Spanish Sherry. Its flavor is legendary and is as varied as the Spanish landscape itself. There are many more experienced Sherry palates on the web to discuss the topic in detail so I’ve chosen to bring one small strata of the world of Jerez to you – El Rebujito. El Rebujito comes from a long line of Spanish drinks that mix beer or wine with juice or soda (sangria, tinto de verano, cerveza clara…). El Rebujito takes this a step further and mixes Fino Sherry with lemonade or, as we experienced more often, 7-Up. Yep, 7-Up. The flavor of the sherry was mellowed by the 7-Up, which managed to take away some of the characteristic acidity of the Fino. Served over ice, it was the perfect midday sipping concoction to enjoy in the local sun-drenched plaza. Mixed with a salty tapa or just a good bunch of potato chips, it was perfect. Having enjoyed the single drinks early on in the trip, imagine our delight when we found it served in a pitcher in a little place in Sevilla, outdoors, on a characteristically scorching Sevilla day. Sherry showed its incredible versatility and variety on this trip. It’s made a permanent home for itself in my bar/armory. And, the Rebujito is a welcome foot soldier in the war to beat the summer heat. After that, you’re home free. You’re in. You can enjoy yourself. If you flinch, you’ll be gone after the first glass – or maybe before. But for those who persevere, surviving the stare is worth it. The place itself is what a wine bar should be. Warm, rustic, all chipped paint, exposed beams, cool pillars, attractive but not ostentatious clientele and a gravity defying wall of wine. Oh, the wall of wine. They feature several varieties of Spanish wines by the glass and even more by the bottle. “La carta” reveals a decent bunch of tapas and tostas that pair well with the wines they serve. The plate of “queso curado” we ordered on the last trip was big and probably some of the best cheese I had while in Iberia. 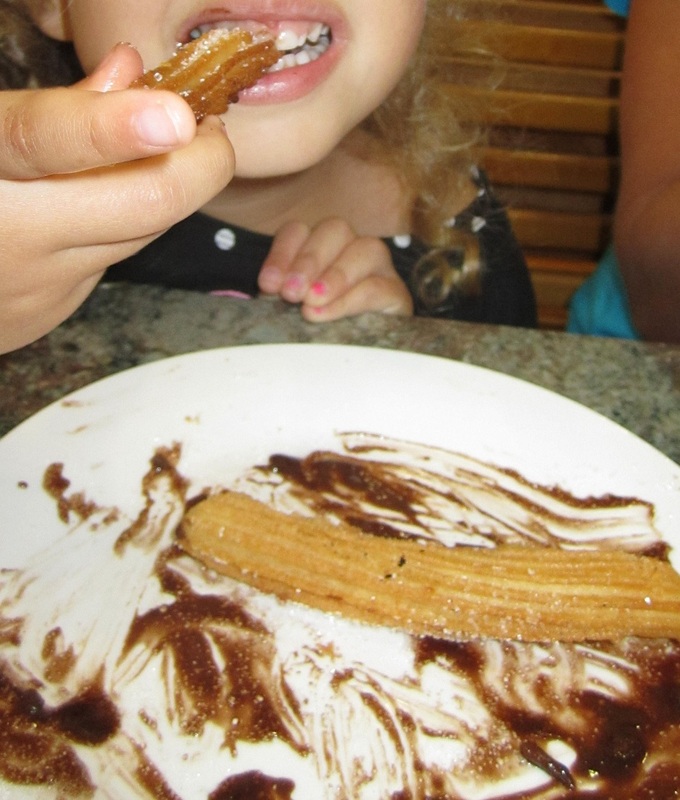 Maybe it was the wine (they have cañas, too) or maybe it was the fact that my 2-year-old made friends with a little Spanish girl whose parents were there enjoying the place as well but El Tempranillo is everything it should be – and nothing it shouldn’t. No wonder the guys behind the bar seem to guard it like jealous boyfriends. It just wouldn’t be the same if it was packed full of people clutching copies of Lonely Planet Spain. Not to mention, those folks would never survive the stare. This has to be my favorite part of Sevilla and it’s certainly one of my favorite characteristics of Spain. Cañas outside in a plaza (this one is Sevilla’s Plaza del Salvador) on a nice day with your closest Spanish compatriots. 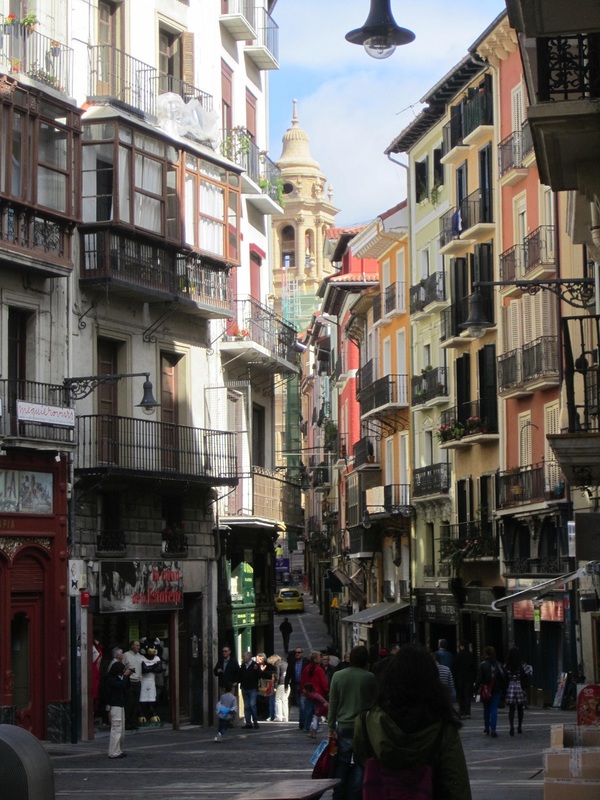 Our cañas were served for 1.10 euros from “La Antigua Bodeguita” located on the edge of the square. There’s something about a glass of beer in a public square that seems just a bit illicit and dangerous as to make it one notch tastier. 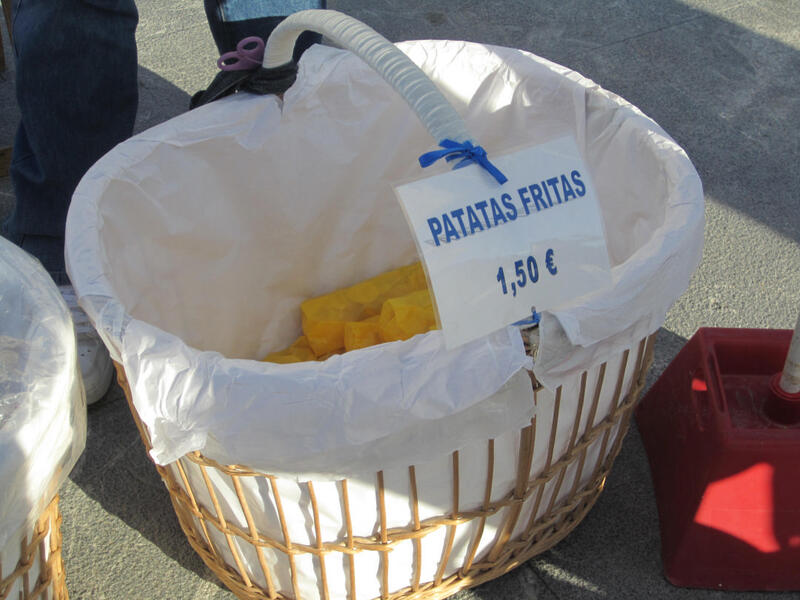 Pair it with fresh fried “Patatas Fritas” from the vendor selling them in the square and you have something as delicious as it is bad for you. Damn the torpedoes. If you ever make it there, I’m told it goes on from midday well into the night. Go.